The Visual Communications Industry Group (VCIG) will feature Compunetix and Chorus Call during their upcoming Member Spotlight Sessions next week on Thursday, September 5 at 1:00 PM ET. The sessions provide the visual communications community the opportunity to familiarize themselves with the products and services industry vendors have to offer. 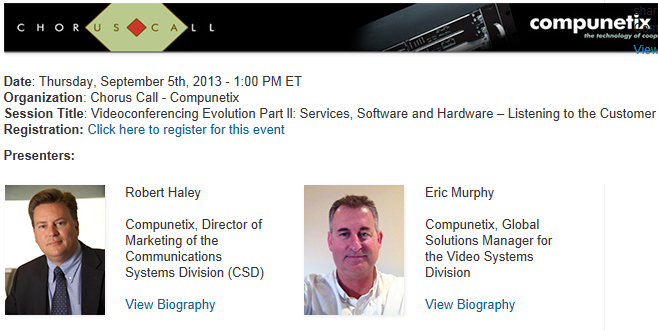 The Compunetix and Chorus Call talk will focus on “Videoconferencing Evolution Part II: Services, Software, and Hardware – Listening to the Customer.” Robert Haley, Compunetix Director of Marketing for the Communications Systems Division and Eric Murphy, Global Solutions Manager for the Video Systems Division will offer their expertise and address questions about the Total Solutions Initiative. Here’s how to register for the event!